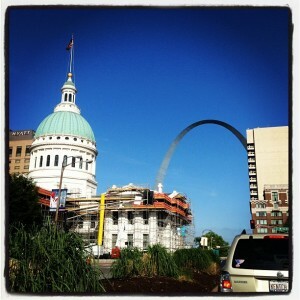 St. Louis A to Z: The Olympics, Ozzie Smith, Old Court House, Oshie, & The Ozarks - JP loves LIFE! I really had no idea what I would use for the letter O when I started researching my St. Louis A to Z Challenge so I did what any blogger would do; I started playing on the internet. I googled St. Louis O and turned up the fact that there had been a summer Olympics here. As I thought about it and as others weighed in, I found several other names. I had no idea that the third Olympiad was held in St. Louis so I had to read through several websites trying to figure out what was going on. I first read about it on the St. Louis wiki called wikilou. I am sure lots of people in St. Louis know all about it but it was news to me and after reading through several sites, including the International Olympic Committee’s page on the 1904 Olympics and have to say the word wow came to mind many times! “Hang on!” you say, why if Chicago in Michigan had been awarded the games did we end up in St. Louis Missouri some 295 miles/475 km away? 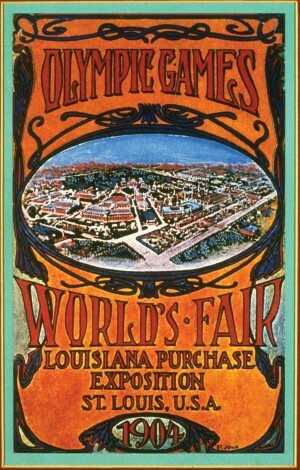 The reason is that once again the World’s Fair was taking place in the same country and the organisers of the Louisiana Purchase Exposition did not want another international event to overshadow their event. They threatened to eclipse the Olympic sports with their own events if the Chicago OGOC (Olympic Games Organising Committee) didn’t move them to St. Louis. So Baron Pierre de Coubertin gave in and his games were once again drawfed by the World’s Fair and very nearly killed off. via Stephen’s Liberal Journal: 1904 Summer Olympics St. Louis: III Olympiad. Yep. St. Louis was host of the Olympics based on blackmail. 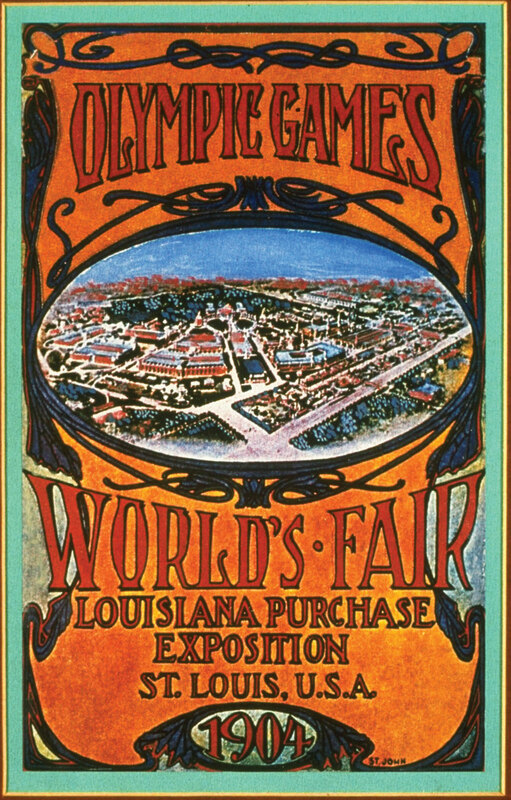 That’s not exactly something to be proud of even if you can see the rationale of wanting to keep the momentum around the World’s Fair celebrating the Louisiana Purchase going rather than shifting north. As I read though, I have to say I wondered if the whole event was a sideshow of weirdness, especially stumbling on this piece from Smithsonian about the 1904 Olympic Marathon. Reading this as a coworker makes final preparations for her first Boston Marathon on Monday leaves one shaking their head. What stands out? Many of the athletes had never trained for a marathon. No doubt that would make for a painful race. Coaches, fans, etc drove alongside the course raising dust that had to give the runners an extra challenge breathing. Runners actually stopped at apple orchards… stopped and snacked. Someone actually accepted a ride for 11 miles of the course and then got back out and ran. A Roosevelt was celebrating the American win with great gusto til someone pointed out the reality. The guy who won had hallucinations, brandy and trainers to help him cross the finish line — he had lost 8 pounds during the race! St. Louis Cardinal fans have a deep love of a few players and, in my experience, Ozzie Smith is a standout. He played in St. Louis in the 1980s & 1990s and is still fairly active in the community. The hall of fame short stop is considered by some to be the greatest defensive player in the history of the game. And he showed how much he loved the sport and the time in the big leagues. He’s actively campaigning that America’s sport — baseball — be honored with opening day being a national holiday. I’ve had the chance to see Smith at several Cardinals games — both on the field for some recognition or in the stands cheering for the home team. I’ve also caught him at a hockey game cause everyone in St. Louis has to love it when the Blues make the playoffs! Which brings us to another O! Early on I wasn’t sure where I’d end up writing about T.J. Oshie and hockey in general. He is a household name after his 2014 Olympic performance. I’ve expressed my relatively new fandom of hockey previously though so I don’t need to go on but I have to say he just had someone take him down and we just had a brief 5 on 3 situation. This one I debated including cause St. Louis isn’t actually in the Ozarks. In fact, the Ozarks are several hours away! BUT it makes the list for a clear reason. When I moved here, I kept hearing people talking about going to “the lake.” I finally asked which lake and had someone look at me like I was nuts. Seems everyone here knows THE lake is the Lake of the Ozarks. Lots of people in the area have a house at the lake for weekends. The Ozarks overall, are a beautiful area of the U.S., crossing the Missouri & Arkansas state lines. It is especially nice to beat the heat of the city or to visit in the fall as the leaves change. The A to Z series about St. Louis is supposed to be a daily post series in April. Everyone should feel free to suggest topics for the upcoming letters or call me out for missing a critical piece. You can see what else in St. Louis gets a shoutout in the A to Z or check out last year’s post for A in my A to Z of Agriculture — last year O was for olives and included some video I got when visiting an olive grower! 1904 St. Louis Olympics: Mediocre? Overcommercialized?